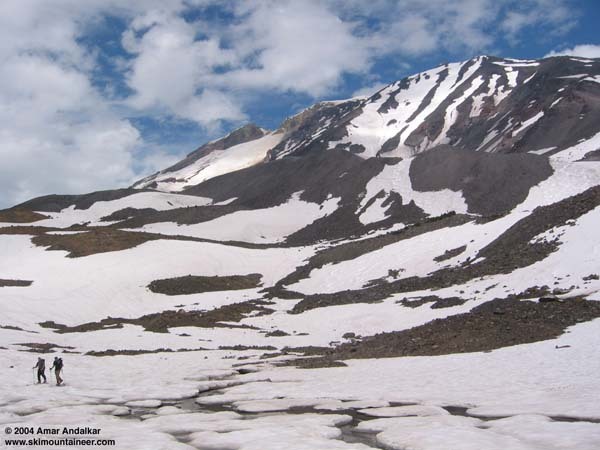 Well, Mount Adams' Mazama Glacier has been on my agenda for several years, but I never managed to get it done. Although longer than the regular South Climb route, it provides a much more scenic ascent with minimal crevasse hazard (most skiers would not bring a rope). Best of all, it avoids the hordes on the South Climb until the routes join atop Pikers Peak. I'd been planning a loop trip on Adams since June, ascending via the Gotchen and Mazama Glaciers and descending the Southwest Chutes. However, recent warm weather meant that the snowpack had been diminishing rapidly since I'd last been on Adams a month ago. With a forecast for good weather to hold through Saturday followed by a turn for the worse on Sunday, I knew it was either now or wait till next year. After failing on several attempts to round up partners for this jaunt, I drove down to Cold Springs by myself on Friday evening, fighting through the Puyallup rush hour and finally reaching the crowded campground just before 11pm. A very warm night, with temps never falling below 59 F, did not bode well for snow conditions the next day. The next morning I was up and on the trail by 5:30am, a bit later than planned. As I left the South Climb trail and headed east on the Round the Mountain Trail, I would not meet another person for 5 hours. I followed the trail for about 1.5 miles, to its high point of 6450 ft just after crossing the upper part of the Aiken Lava Bed. I headed north up a gentle gully towards the Gotchen Glacier moraine, reaching a ribbon of continuous skiable snow at 6700 ft. I cramponed up on foot to crest the terminal moraine at 7300 ft, and was dismayed to find the other side melted snow-free, necessitating a nasty traversing descent of the extremely loose and unstable moraine. The Gotchen itself was easily skinnable with a softened snow surface, but I continued angling to the NE on foot, finally crossing the moraine separating the Gotchen and Mazama Glaciers at a prominent 8000 ft pass. The Gotchen was still crevasse-free at this time, and the lovely blue moraine-dammed lake at its toe was partially unfrozen. From the Mazama Glacier's lateral moraine, I descended a bit to reach skiable snow at 7900 ft. I skinned north angling right across the Mazama, aiming above the 8300 ft Mazama Glacier Saddle (Sunrise Camp, with several tents visible). A few narrow crevasses and areas of bare blue ice were visible on the lower Mazama, but nothing really to worry about. Much more alarming was the faint sound of running water as I neared 8600 ft, followed by the realization that the lower part of my pack was dripping wet. F#$%, after 8 years of using Platypus hydration bags, one of them had finally burst on me in the field. I had just topped it off from a water bottle when I had stopped to put on skis, so I lost nearly 1.5 L of water (a big disaster for someone who drinks as much water as I do during a major ascent). Thankfully, I still had a liter left in a Nalgene bottle, so all was not lost. High clouds had unexpectedly covered much of the sky, so I figured I could make it to the false summit by carefully conserving the remaining liter (the snow looked far too dirty to eat unless truly desperate). I continued skinning all the way to the top of the Mazama Glacier at 10200 ft, expect for a short steeper pitch at 9200 ft where it was faster to carry the skis than traverse on skins. The route steepens above 10200 ft, so I put the skis on my back for good. I met the first climbers of the day descending towards me and then followed their boot pack up. Well-softened snow meant that crampons were not needed. As I passed 11000 ft, the increasingly dark and ominous clouds spit out a few raindrops, but clear skies were steadily approaching from the south so this was of little concern. As I crested the false summit at 12:45pm, full sunshine broke through and a beach/circus atmosphere prevailed among the lounging crowd. Entertainment was provided by a woman who set off glissading down the deep trough, alternately attacking and being attacked by her unruly German shepherd who clearly did not want to glissade. Lots of shouts and barks until they dropped out of sight. What a place. Given the late hour on such a warm day (14000 ft freezing level) and my ongoing water crisis, I decided to forgo the true summit. I skied down the SW Chutes at 1pm, just ahead of a group of three that was also preparing to ski down. The snow surface was quite rough and heavily suncupped/cratered all the way from the top, the heavy traffic of June and early July has bombed out the surface on this route worse than I've ever seen before. I didn't think it was possible for a big mountain ski route to get so tracked out in summer conditions, but the SW Chutes have almost certainly seen more skiers this year than in any previous year and they appear to be suffering the ill effects. Luckily, snow conditions were just right despite the very rough surface, as the clouds had prevented oversoftening despite the warmth. About 1-3 inches of corn on a firm base, with occasional icy scratchy noises heard along the edges of the bigger craters. No major sluffs while skiing, but lots of small roller balls. Most people would say the snow surface sucked, but I still had fun skiing it, and those who go prepared for such conditions would enjoy it too. Below 9000 ft, the snow surface is heavily ash-covered and I skied very black snow through the steepest lower part of the main chute. The other 3 skiers above me cut across to the right chute to avoid this steep section, but suffered on a much rougher surface consisting primarily of raised old ski tracks in the lower right chute. Lots of rocks are scattered across the lower sections too, and rockfall was continually coming down along the edges of the chutes (luckily no major rocks came down the route itself during our descent). We enjoyed the best snow of the whole descent on the final pitch from 7500 ft into the terminal basin, a much smoother surface with fine corn. Below the basin, a broad ribbon of rough gray and black snow still extends along the right edge of the drainage, and we skied continuously down to 6700 ft, crossing a couple of short bare areas on skis. A quick hike down the right edge of the stream gully (too quick for the other skiers who rapidly fell way behind) brought me back to the Round the Mountain trail beside the familiar waterfall at 6100 ft, and I filled my long-empty water bottle and finally quenched my thirst. An hour of hot sunny hiking along the up-and-down trail brought me back to the car by 4pm. It was a long but scenic day, with over 6500 vft of total ascent for 4900 vft of fair to good skiing. Not a bad run for mid-July, and the pitch to the true summit looked to be in decent shape for skiing too, providing a potential run of nearly 5600 vft. The ascent route via Gotchen and Mazama Glaciers would have been better a couple of weeks earlier, when the moraines at both ends of the Gotchen would still have been snowcovered (the route would then be continuous snow from the RTM trail to the summit). This view looks up at the SW Chutes from the basin at 7000 ft. We skied around the right edge (skier's left) of the lower moraine, but most tracks visible in the photo are several days old. The upper part of the SW Chutes look OK in the photo, but the very rough surface could be easily seen with the eye even at this distance. Much smoother looking were the Avalanche-White Salmon Glaciers, visible at upper left, where only a few recent tracks marred the pristine-looking surface. I skied this spectacular route a month ago in superb conditions (see trip report), but the direct view from FR 23 at the end of the day revealed that the entrance to the White Salmon Glacier from the summit icecap has now nearly melted snowfree, so a short downclimb on steep loose rock may be needed to reach the smooth glacier surface. Click here for an enlarged version of this photo. The snow surface was quite rough and heavily suncupped/cratered all the way from the top, the heavy traffic of June and early July has bombed out the surface on this route worse than I've ever seen before. I didn't think it was possible for a big mountain ski route to get so tracked out in summer conditions, but the SW Chutes have almost certainly seen more skiers this year than in any previous year and they appear to be suffering the ill effects. Yes, a lot more people this year (at least the days I was there). The day I skied chutes this year (July 3rd), it seemed more people skied the chutes than the south slope. Even on July 3rd the snow was not very good, very mushy and unconsolidated and it seemed like the chutes had more rock debris than last year. I was puzzled too why there was such a stark difference in chute skiing quality from this year to last, when even in the 3rd weekend of July last year a bit after 2:00 pm they were really great (smooth, firm and easy at least the top 3000'). I was thinking the weather patterns of spring and early summer had more to do with the SW chute snow quality, but your take is interesting too. Nice report. I was climbing that day, through the dog route (ugh; had a friend with zero glacier experience, no Mazama). There was indeed a fair number of people skiing there, though some of them also descended the south route. If it's too steep, you're too old. Could it be a combination of both above average skier volume and weather patterns? It seems like upper elevations got a good amount of snow in late May thru early/mid June, then it warmed up rapidly not fully consolidating and everyone started hitting the bc. There was probably a higher concentration of skiers then since the weather for a number of weekends in May and early/mid June was poor. There were an above avg amount of tracks on the bowls below Mt Hood's Snowdome as well. If interested, click to see photo. I skied the White Salmon / Avalanche Gl the weekend before last with Jack McDonald from Vancouver BC. �Yes, we had to downclimb the steeper upper section due to lack of snow coverage and rotten snow (large suncups mixed with dirt). �It appeared that if we had stayed higher, rather than dropping to the notch by the Pinnacle, we might have been able to ski (or side slip) down where there was more continous snow, but I'd guess that may have changed by now. �After downclimbing about 100ft, we were able to put on skis and traverse skiers left for good distance before our descent. �We found completely untracked snow and no crevasse problems, but it was not effortless skiing with slightly suncupped and gooey snow conditions (at about 2pm). �Agree it's a great line for about 1500' before dropping left onto the Avalanche Gl for a nice steeper pitch. �Overall, it seemed less steep and somewhat shorter than the SW Chutes (maybe 25-30 degrees max), but with the distinct advantage of being alone on a great slope. �Thanks for your earlier trip report Amar which gave us the tip to try the route. �After skiing the SW Chutes last year, I had looked at the White Salmon/Avalanche as an alternative ascent route to avoid the crowds; but it is definitely a worthy descent as well. �As we traversed under the SW Chutes exit, I was amazed to see how tracked the chutes were compared with last year.